Sea grape Molgula manhattensis, copyright Wilfried Bay-Nouailhat. 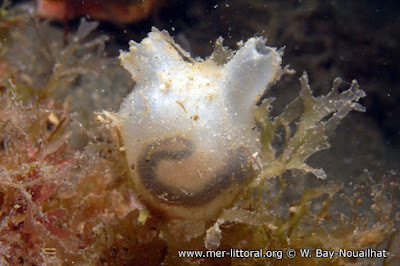 The Pleurogona are a group of tunicates characterised by a folded pharyngeal basket, and the lack of an abdomen. [CGS00] Cameron, C. B., J. R. Garey & B. J. Swalla. 2000. Evolution of the chordate body plan: new insights from phylogenetic analyses of deuterostome phyla. Proceedings of the National Academy of Sciences of the USA 97 (9): 4469–4474. [GO78] Gallardo S., C., & C. Osorio R. 1978. Hiatella solida (Sowerby, 1834) (Mollusca: Hiatellidae) on Concholepas concholepas (Bruguière, 1789) and other substrates. Veliger 20 (3): 274–278. [G75] Grant, E. M. 1975. Guide to Fishes. The Co-ordinator-General’s Department: Brisbane (Australia). [L70] Leloup, E. 1970. Recherches sur l’ostreiculture dans le bassin de chasse d’Ostende en 1968. Bulletin de l’Institut Royal des Sciences Naturelles de Belgique 46 (6): 1–24. [M86] Monniot, F. 1986. Urochordata=Tunicata: les ascidies interstitielles. In: Botosaneanu, L.(ed.) Stygofauna Mundi: A Faunistic, Distributional, and Ecological Synthesis of the World Fauna inhabiting Subterranean Waters (including the Marine Interstitial) pp. 705–708. E. J. Brill/Dr. W. Backhuys: Leiden. [RZ03] Romanenko, L. A., N. V. Zhukova, M. Rhode, A. M. Lysenko, V. M. Mikhailov & E. Stackebrandt. 2003. Pseudoalteromonas agarivorans sp. nov., a novel marine agarolytic bacterium. International Journal of Systematic and Evolutionary Microbiology 53: 125–131. [S79] Sabbadin, A. 1979. Colonial structure and genetic patterns in ascidians. In: Larwood, G., & B. R. Rosen (eds) Biology and Systematics of Colonial Organisms pp. 433–444. Academic Press: London. [SM10] Saffo, M. B., A. M. McCoy, C. Rieken & C. H. Slamovits. 2010. Nephromyces, a beneficial apicomplexan symbiont in marine animals. Proceedings of the National Academy of Sciences of the USA 107 (37): 16190–16195.